It has formed naturalized populations in western Europe, Africa, and Australia (Grasses of Iowa). Naturalized in California (Calflora). Iowa State University (0). Grasses of Iowa. 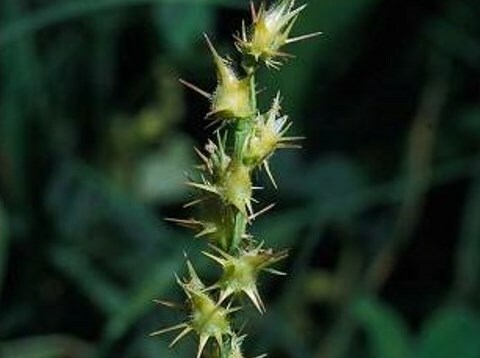 Longspine sandbur is a troublesome weed in many irrigated crops in the westem United States (Time of emergence and seed production of longspine sandbur (Cenchrus longispinus) and puncturevine (Tribulus terrestris)). It is a noxious weed in Europe, Australia and New Zealand where it was introduced (Wikipedia). Considered a noxious weed in California and Washington (Go Botany). Boydston, R. A. (1990). Time of emergence and seed production of longspine sandbur (Cenchrus longispinus) and puncturevine (Tribulus terrestris). Weed Science. 16–21. New England Wild Flower Society (2016). Go Botany. It is a noxious weed in Europe, Australia and New Zealand where it was introduced (Wikipedia). Considered a noxious weed in California and Washington (Go Botany; CDFA). Cenchrus echinatus is considered invasive in California; Similar exotic species: Cenchrus ciliaris (FloraBase: The Western Australia Flora). Cenchrus spinifex is an aggressive invader in Arizona (Invasive Plants and Weeds of the National Forests and Grasslands in the Southwestern Region 2nd edition). C. echinatus is considered a noxious weed in Arizona (USDA-NRCS Plants Database), Australia (Wikipedia). It can grow in many habitats and is found in dry and moist regions in rainfed and irrigated crops and has been reported as a weed of 18 crops in 35 countries, mostly in cereals, pulses, vineyards, plantation crops and pastures. C. echinatus occurs as a weed in many crops worldwide. It is common in cultivated fields, pastures, fallows, orchards, vineyards, coffee, vegetables, bananas, coconuts and lawns, where it can withstand repeated defoliation. It can be found along roadsides and beaches, in open ground and waste places. Crops competing for nutrients with C. echinatus typically have smaller leaf areas and lower growth rates and yields (CABI; Crop Science). Invasive in many regions throughout the world, especially tropical regions, and Australia, China, Japan, and New Zealand (PIER). Native to central and eastern U.S. (Jepson). Present in central U.S., Mediterranean region and other parts of Europe, central Australia (CABI). Plants often form large mats and can grow to 2 feet (0.6 m) in length (UC IPM). Can spread rapidly and has a tendency to develop into dense infestations in favourable conditions (NSW Weedwise). Given the mat-forming tendencies of this species, it is likely that native plants could be displaced in areas of severe infestation, but an exhaustive Google/Google Scholar search did not reveal evidence of this, and this defaults to a "no" answer. NSW Department of Primary Industries, Primary Industries Agriculture, New South Wales Department of Primary Industries (2014). NSW Weedwise. Immature sandburs provide good forage for livestock. However, when they mature they develop fruit with stiff spines that can injure the mouths of animals and the hands and feet of people (UC IPM). Mature burrs cause a range of problems such as: injury to stock causing swellings and ulcers in the mouth; injury to people and dogs; clinging to wool and penetrating the skin of stock, reducing the value of both; shearing difficulties, which often attracts penalty rates as working with contaminated wool requires leather gloves and/or aprons; inconvenience and discomfort to workers in irrigated crops such as vegetables, vines and citrus, and; contamination of dried fruit and hay (NSW Weedwise). The weed is also a contaminant in dried fruit and may infest lucerne hay (Agriculture Victoria). Plants often form large mats and can grow to 2 feet (0.6 m) in length (UC IPM). The spines of spiny burr grass can easily puncture the skin of animals and has the potential to injure fauna. Spines may also injure humans.Burrs are present for much of the year. The plant does not pose any restrictions to human movement except when burrs are present (Agriculture Victoria). An exhaustive Google/Google Scholar search did not reveal any evidence of reproduction by asexual means, and this defaults to a "no" answer. An exhaustive Google/Google Scholar search did not reveal any evidence of reproduction by asexual means or fragmentation, and this is a terrestrial grass that is unlikely to fragment, so this defaults to a "no" answer. Reproduces by seed (NSW Weedwise; UC IPM). Can produce over 5600 burs per plant. Assuming an average of two seed per bur, plants produced approximately 133,000, 49,000, 5,000, and 40 seed per plant from May, June, July, and August plantings in 1986, respectively (Time of emergence and seed production of longspine sandbur (Cenchrus longispinus) and puncturevine (Tribulus terrestris)). Fall-planted longspine sandbur began to emerge in April, peaked in late April or May, and continued at low levels through October. During the first year after seeding, 98% of the total seedlings emerged prior to June. Longspine sandbur germinates more readily from cultivated sites than from undisturbed sites, and (Time of emergence and seed production of longspine sandbur (Cenchrus longispinus) and puncturevine (Tribulus terrestris)). 84% of seasonal emergence occurred within a 4 week period from May 25 to June 15, but continued into August (Longspine sandbur (Cenchrus longispinus) ecology and interference in irrigated corn (Zea mays)). Anderson, R. L. (1997). Longspine sandbur (Cenchrus longispinus) ecology and interference in irrigated corn (Zea mays). Weed technology. 667–671. Annual plant (Time of emergence and seed production of longspine sandbur (Cenchrus longispinus) and puncturevine (Tribulus terrestris)). Flowering takes place from July through September (UC IPM; Calflora). Burs disperse in many ways such as by clinging to animals, shoes, clothing, tires, machinery, and floating on water (UC IPM). Burs disperse in many ways such as by clinging to animals, shoes, clothing, tires, machinery, and floating on water (UC IPM). The weed is also a contaminant in dried fruit and may infest lucerne hay (Agriculture Victoria). CDFA source added for Q4; confidence level changed to High. Nothing else changed. Reviewed by Elizabeth Brusati (edbrusati@cal-ipc.org, Cal-IPC).